Frances Greenough's practice has always centered on the subject of landscape, whether it be the real landscapes that surround us or fictional landscapes she creates. 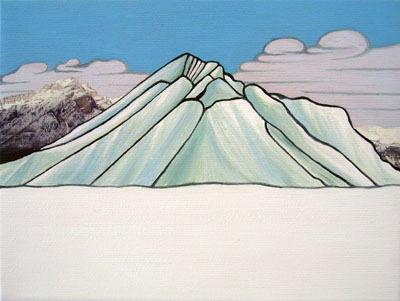 Her love of landscape stems from her parents and their keen interest in walking and mountaineering. These interests have now become her own and Frances is an active walker and climber. Her earlier paintings were invented through a process of collage using collected images from tourist brochures, magazines, books and her own photographs. Through collage Frances aimed to create a landscape that is believable, but the idyllic, mountainous scenes she presented often hinted to their invented nature. An exchange trip to Canada, whilst Frances was studying at the Royal College of Art led to a new way of working, which explored the mixing of the photographic image with the painted image. The time Frances spent in Canada gave her an insight into how another culture views and uses their landscape, the experience was heightened by the vast difference and the scale of the plain lands and the Rocky Mountains compared to the landscape of her native England.